LONGMONT, COLO. (Aug. 31, 2015) –CLIF Bar CrossVegas, a Telenet UCI World Cup Cyclocross race hosts “Meet the Pros” on Tuesday, Sept. 15, 2015 from 6-8 p.m. inside The Pub at the Monte Carlo Las Vegas Hotel and Casino (3770 Las Vegas Blvd.). The event, free and open to the public, offers cycling fans the chance to meet, get autographs and take photos with a few of the world’s top professional cyclocross racers including two-time World Champion and winner of CrossVegas in 2013, 2014, Sven Nys of Belgium, and U.S. rider Jeremy Powers, three-time national champion and 2012 CrossVegas winner. Both will be competing in 2015 CrossVegas on Wednesday, Sept. 16 at Desert Breeze Soccer Complex. The event at Monte Carlo also serves as check-in and race packet pick up for registered racers competing in the USA Cycling amateur categories or the Wheelers & Dealers industry event. Spectator tickets for CrossVegas are $15 for adults; children under the age of 12 are free. Clark County residents can redeem a $3 discount using the code CrossVegas15 at http://bit.ly/1KsXQSs. Limited spots for racers interested in competing at CrossVegas are available at www.crossvegas.com. Registration is $60 and is open until Saturday, Sept. 12, 2015 at midnight PT; there is no on-site registration. Registration includes admission to view the races later in the evening. CrossVegas is the largest annual cyclo-cross race in the U.S. and takes place following the first day of the Interbike International Bike Expo, held in Las Vegas each September. Launched in 2007, CrossVegas attracts competitors from more than 15 nations with national teams of eight men and eight women competing in the elite categories. The race includes a 3.3-km (1.75 mile) mostly off-road course featuring variety of terrains that includes pavement, grass, steep hills and barriers, requiring cyclists to dismount to navigate obstacles then remount their bicycles to finish the race. The Universal Sports Network will broadcast CLIF Bar CrossVegas, from 8 to 11 p.m. PST. CLIF® Bar CrossVegas is organized by Watts Marketing Inc. of Longmont, Colo. and has become a fixture on the international cyclocross calendar. It is the largest cyclocross race outside of Europe and each September it attracts 10,000 spectators to Desert Breeze Soccer Complex in Las Vegas. 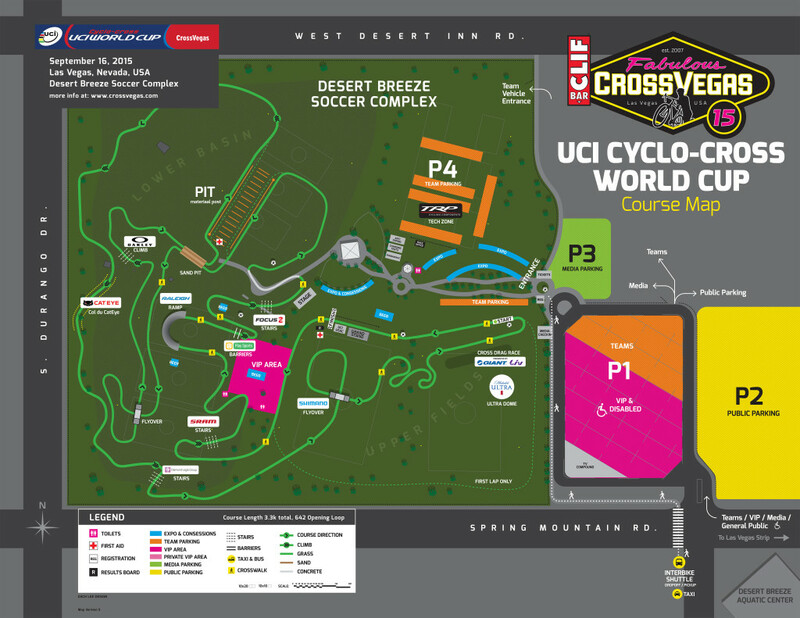 Complete information including schedule, hotel information, sponsorship and admission is available at crossvegas.com. For more information, please connect with CrossVegas on Facebook, Twitter, Instagram and LinkedIn. Is Styby gonna be in Vegas?? !